This place is luxury plucked straight from your school Latin books. (Well definitely mine). Built in the second half of the sixteenth century by the Bettini family, Villa Le Maschere, is a 5* Luxury resort and Spa (wellness center) set up in the Tuscan hills of Mugello and just outside of Florence Italy. The building is a late Renaissance country home in Tuscany. Where to start? The building? The rooms? The Grounds? The View? On walking into any of these, you feel as if this is something special. We drove across from Bologna to Barberino and the two places could not be more different. Where Bologna is a main city of business and finance, Barberino is a relatively untouched piece of renaissance heaven that really makes you feel special. Where Italian opulence meets modern beauty. The Spa/Wellness centre was also a great addition and the treatments (facials) were just what I was looking for. Downstairs, it feels as if you have been lead into an underground medieval castle stone ancient passage way, with tunnels, walkways and hidden rooms at every corner. One of which was the breakfast room. Again, keeping the traditional style, they added elements of modern with floor to ceiling glass cut out walls and modern furnishings. 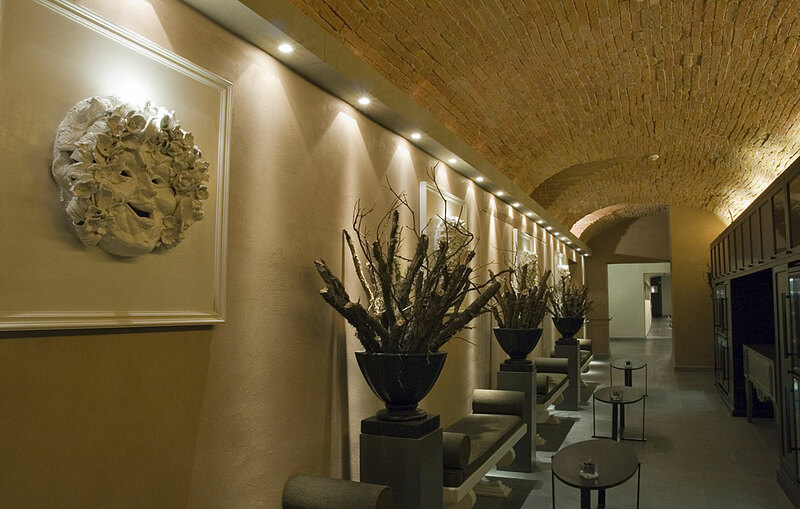 Other rooms in this underground secret passage included a private dining room (which looks like something from the knights of the round table), and one of their 3 restaurants, “IL PIOPPONERO”, where they have restored the brick vaults of the ancient cellars of the palace. Since the 16th Century, Villa Le Maschere was considered one of the most beautiful Tuscan villas and was the chosenstay for popes (Pius IX in 1857), sovereigns (Carlo Emanuele IV King of Sardinia in 1801, King Carlo Felice in 1821), as well as many renowned noblemen and artists from the 17th Century. My advice? Get off this review, and get onto their booking site immediately.